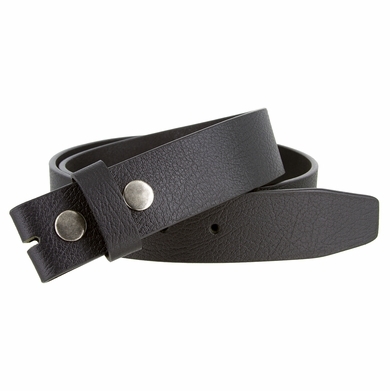 1-1/2" = 38mm Wide texture genuine full grain leather belt. The brown belt comes with color brass snaps and the black belt with color antique silver snaps. 7 Holes for easy fit adjustment and two snaps to take on and off the buckle with one matching loop. Perfect casual belt for a ready to wear. Belt is measured from where the leather folds by the buckle to the middle hole at the tip end. Take a measurement of a belt that you currently wear and measure from where the leather folds by the buckle to the hole that fits the best. That number in inches is your belt size.